Maybe it's 'Back to Basics' or 'Everything Old is New Again' but Cloth Bags are back in a big way! And our cloth bags are made from natural cotton - the perfect renewalable, reusable resource. Currently available in three styles with more on the way, these bags are finding hundreds of new uses. Plus we've added the latest technology to these traditional bags. We can digitally print your designs - your logo - your favorite photo - or just about anything you can think of - right on the bags. We'll print a single bag, a hundred bags or thousands - whatever you need. Look through our catalog to see what we've got or feel free to contact us with new challenges and ideas. There are 3 different stock styles of cloth drawstring parts bags made from natural cotton - there is definitely a bag for you. 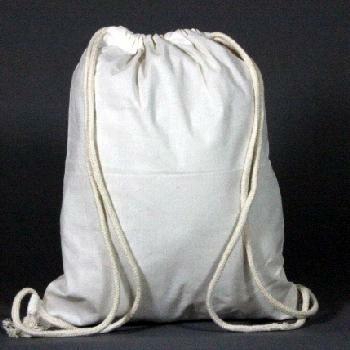 You'll find 9 sizes of standard single drawstring bags, 15 sizes of double drawstring bags, and 10 sizes of 100% natural organic cotton single drawstring bags. And if you can't find the perfect size .... we can custom make bags for you. The tight weave of these bags provides a perfect canvas for your logo. Since these bags are used over and over...they are a great way to get your name out there! Find more details in our catalog. We've added 5 stock sizes of Tie-Top bags. Similar to drawstring bags, these bags are taller so you can package your product and close the top with a decorative closure. Of course they can be printed or custom sized. Find more details in our catalog. And all Tie-Top bags are Made in the USA! We've added 6 stock sizes of Tote bags. These bags are great for party favors, gifts or carrying your lunch! Like our other cloth bags, they can be printed or custom sized. Find more details in our catalog. And all our Totes are made in the USA! If you can't find the exact size you need in our stock selection, we're happy to create a custom sized drawstring, Tie-Top, or Tote just for you. Add custom printing to one or two sides and you'll have an environmentally friendly package totally unique to you! Just look at some of those colorful samples above. Print one, print 100, print 1000 or more .... we'll help you design just the right cloth bag for you. Best of all, cloth bags won't break the bank. Sold in convenient packs of 100 bags, you can try some on for size first! Check our prices - they are better than ever. 14" x 18" Cotton Backpack bag; Double drawcords (each) PLUS SPECIAL PRICE!